Unfortunately, we don't really have too much good to say about Play Piano Tonight. The course itself is not very large or comprehensive by any stretch and does have some significant issues. We soon found out that Mr. Worthy is indeed a talented musician, but as a teacher and course creator... well, let's just say there's lots of room for improvement. Mr. Ron's online members area was quite a letdown, as it basically consists of a single html page that teaches fair bit of piano theory, some exercises and sound examples as well as several movie clips to help you along. The video quality really disappointed, as it seemed on par with footage taken with a webcam. The training material itself is not appropriate for beginners, despite how the course is advertised. The webpage or "eBook" as they call it only works out to around 25 pages when copied onto a standard word document. It became clear pretty quick that this course wasn't worth the $97 we paid for it. Included with the piano mini-course is some unique freeware bonus software called the "Karaoke Piano Player". While it's not the most intuitive software you'll ever use, it's helpful none-the-less. The bonuses include some free sheet music from a major distributor and a music dictionary. Mr. Worthy tries to set his course apart by advertising personal support for his students. You can contact him using his personal phone number and email address, or by using his student forum. In the past however, we were never able to get the forum to load. It's pretty much impossible to have any difficulty using Play Piano Tonight as it's essentially a single webpage with a few embedded multimedia elements. The real problems you'll come across is actually trying to make sense of what he's teaching. It used to be that if you wanted a refund you'd have to go through Mr. Worthy, which is reported as not being much of a "people person". Thankfully, there is now a refund policy in place from the payment process that handles purchases on Play Piano Tonight's website, Clickbank. Mr. Ron's Tricks of the Trade multimedia ebook is merely OK in value when you compare to private piano lessons.We still wish it wasn't so incredibly expensive for what you get. As a good downloadable piano lesson course, Mr. Ron's Tricks of the Trade mini-course is of dubious value. There are other piano courses out there do a significantly better job at a better price. Have you tried Mr. Ron's Play Piano Tonight before? Let us know what you thought by writing your own review! 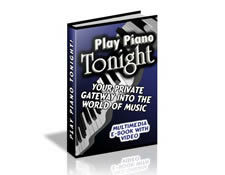 Mr. Ron's Play Piano Tonight "eBook" course material is way beyond the scope of someone who is just starting to learn the piano. Ninety-seven dollars also seems a huge price to pay for what is essentially a single-page multimedia webpage tutorial.